My app target is code signing just fine - but my test target is not. I bought a new computer, created a new development certificate from the computer, updated the provisioning profile accordingly, installed both, but can't get past this code signing error. Any way of wiping all certs/profiles locally so I can reinstall? Probably some kind of bug. The problem is the project is under source control and every time I pull the .xcodeproj is updated. And since my provisioning profile is different than the one in source control, the Unit Test target automatically switches to "Do not code sign". So I simply have to set the profile there after each git pull. Apparently if deploying to a device, if there is a unit test target, it must be code signed. That is all I had to change to get it to work. I fixed the issue (temporarily) by going to Edit Scheme, then in the Build section, removing my unit test target from being invoked in "Run". I fixed it by manually selecting a provisioning profile in the build settings for the test target. 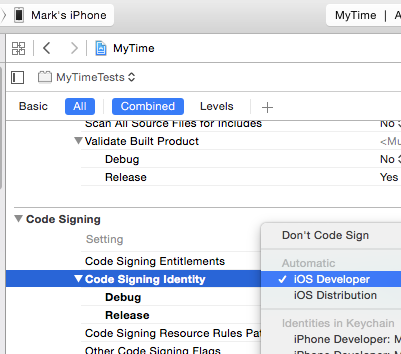 Test target settings -> Build settings -> Code signing -> Code sign identity. Previously, it was set to "Don't code sign". I changed mine from "myIphone" to simulator iPhone 6 Plus, and it solves the problem while I'm developing the app. Fortunatelly, the target did not implemented anything, so a quick solution is remove it. I was getting this error when running xcodebuild from commandline for integration tests on my work's CI. I managed to get it working by setting the project level setting to codesign. For some reason the target setting was being ignored and it reverted to the project's setting. From Targets select appnameTests Under "Info"
Hi I face the same problem today. After reading "Spentak"'s answer i tried to make code signing of my target to set to iOSDeveloper, and still did not work. But after i changing "Provisioning Profile" to "Automatic", the project got built and ran without any code signing errors. Sometimes this happens when you download a project from github or other third party tutorial sites.These apps are usually signed with a different identity or company/name.When this happens,if you can't solve the solution,simply create a new xcode project and copy all the header and implementation files into your new project.Also don't forget the dependency files..such as the framework files.This works for me. Not the answer you're looking for? Browse other questions tagged ios objective-c xcode or ask your own question. 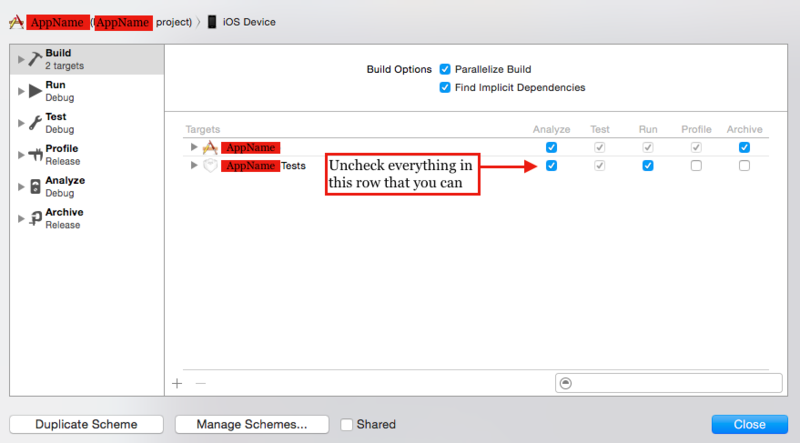 Getting error on building a app on Xcode 6.1?